Alarm clocks are part of daily life, and alarms have been familiar complications in mechanical table clocks for quite some time. This complication migrated to wrist watches gradually, but it was the Vulcain Cricket that set the standard. Introduced in 1947, the Cricket featured two crowns and barrels, one for powering and setting the time and another for the alarm. This was quickly followed by the Jaeger-LeCoultre Memovox, which introduced a central disc to set the alarm rather than a fourth hand. This early Vulcain Cricket is a typical example with an amusing provenance: Owned by “B’way Sam” Roth, one can imagine him using the alarm to keep appointments all over Times Square in the 1950’s. It’s listed at $999 on eBay right now, and I imagine it will sell for not much more than that. After a short run with the decidedly finicky Cal. 489 and 601, Jaeger-LeCoultre settled into series Memovox production with their Calibre 814 around 1953. Those Memovox watches were produced in larger numbers, were more serviceable, and added an optional date complication as well. They are small watches for modern wrists, but any Memovox is cool and useful! This example goes under the gavel at Auctionata in New York on January 31, 2015. It’s not very special apart from being a USA model with the “LeCoultre” dial and domestic gold-filled case. But with a starting bid of $900, it’s worth a look at least. This travel alarm clock is a great way to get into Jaeger-LeCoultre on a budget! If you’re into manually-wound alarm movements on a budget, however, take a look at this Jaeger-LeCoultre travel alarm clock. 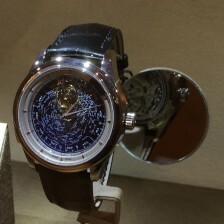 It has Jaeger-LeCoultre’s updated Calibre 911 and comes in an attractive and well-finished case. The starting bid is just €240 in Auctionata’s February 6, 2015 auction and I imagine it won’t go for much more unless a collector needs a replacement movement for his Memovox. Both the Cricket and Memovox lacked a real chime for the alarm, however. Instead, a hammer pounded on the case or a bit of steel inside it, making more of a buzz or rattle. This, in fact, was the source of the Cricket name chosen by Vulcain! It was not until the 1990’s that Jaeger-LeCoultre introduced a true chiming alarm, and then only on a manually-wound Memovox. Another difficulty was adapting an automatic winding mechanism to an alarm watch. Jaeger-LeCoultre solved this first by using a so-called bumper winder, where the rotor did not spin a full 360º, leaving room for the alarm hammer. Later they took the novel approach of passing the alarm hammer through an enlarged center hole in the automatic winding rotor. Along with so many other innovations in horology, 1969 saw Jaeger-LeCoultre introduce the “Speedbeat” Calibre 916 Memovox line. These were updated with a free-turning 360º rotor and high-speed 28,800 A/h movement, along with modern shock protection and manufacturing techniques. This movement would last in production for a decade, but it wasn’t until 1994 that Jaeger-LeCoultre produced a modern Memovox replacement. This Speedbeat Memovox is typical of the 1970’s with its space-age design and cushion case. Jaeger-LeCoultre tried many case and dial styles at this time, so novelties like this won’t often encounter their twin. With a starting bid of €1,200, it’s a little on the high side for a retro case, but I bet someone will fall in love with it and pay a bit more at the February 6 auction. The larger case helps make it a bit more modern in feel. As the Swiss watch industry entered its modern renaissance, many former case-and-dial brands decided to try their hands at movement making, often starting with complications like an alarm. Such is the case with Oris, who introduced their Calibre 418 (really just a module) in 1988. It features a real gong for a purer sound. Though it is still manually-wound, this Oris alarm watch deserves a look. As noted, Cal. 418 is historic for the company and it has an up-to-date look even if the case remains tiny at just 34 mm. It also has the original box and papers though I can’t vouch for the band and clasp. It’s a steal at the starting bid of €400, though I suspect keen-eyed bidders will push it to twice that at least. I had a double-take when I spotted this Montblanc Meisterstück Reveil’s Calibre 914: That’s the same number of a very fine and modern Jaeger-LeCoultre chiming alarm movement! But alas, the name is the only thing in common as this watch predates the joining of those houses under the Richmont umbrella. Instead, it uses a variant of the old A. Schild AS 5008 automatic alarm movement likely the one produced by La Joux-Perret. Still, it’s a nice looking watch with modern and retro flair and bears the name of up-and-coming Montblanc. I’d bite at €800, though I wouldn’t go much higher than that as these routinely sell for $1,200 or so. So there you have it! Six Reveils likely to sell for under $1,500. Each with its own quirks and differentiators and each worth space on the wrist of any enthusiast on a budget! Fancy very expensive watches are a whole new world to me. I get by fine with a $30 Casio analog/digital with a 10-year battery and my latest watch – a Pebble. Works fine, does neat things – good enough is good enough! Shouldn’t this article also lentin the Seiko Bellmatic, that on its introduction in 1967 was the first central rotor automatic alarm watch. The early ones are quite handsome watches, and can be found for real bargain prices. And they have quite a nice wrist presence, imho.